The shiny, new Dundee United got their summer action off to a promising start with this friendly win over Brechin at Glebe Park. A classy individual goal from Fraser Aird gave the Tangerines the lead on just eight minutes of the pre-season clash. The second one came with 10 minutes to go when a volley from United substitute James Keatings crashed against the bar and the rebound struck City player Euan Spark and crawled over the line. 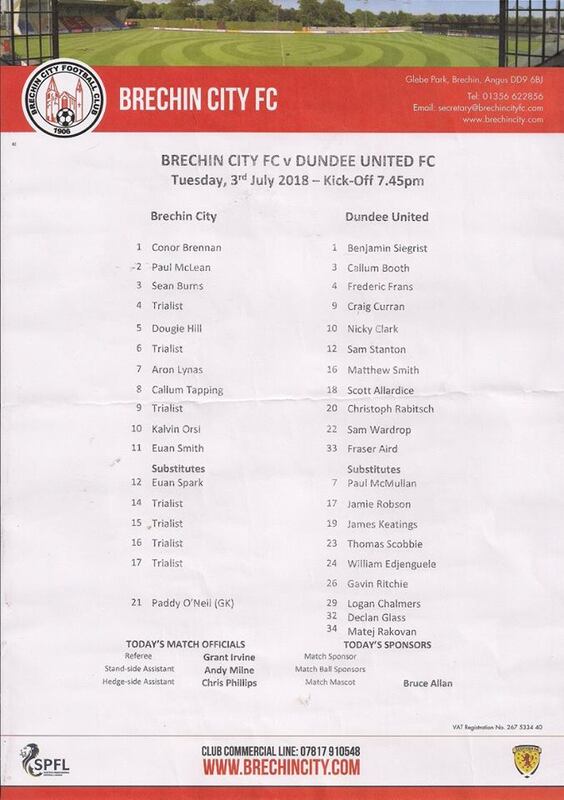 This was certainly an all-change Tannadice side, with no fewer than eight of the club’s new signings in the starting line-up. They were Benjamin Siegrist, Callum Booth, Frederic Frans, Craig Curran, Nicky Clark, Christoph Rabitsch, Sam Wardrop and Fraser Aird. Frans was the captain for the night and the big Belgian was partnered in central defence by Scott Allardice. City, of course, held the Tangerines to a draw here in the Championship last season and also secured a 1-1 friendly result against Dundee last Friday. The visitors took just eight minutes to move ahead and it was thanks to a superb solo goal from Aird. The Canadian international picked the ball up 40 yards from goal, jumped a couple of challenges, cut inside then curled a terrific right-foot shot past keeper Conor Brennan and into the Brechin net. Sam Stanton was fouled on the edge of the box by City defender Paul McLean on 13 minutes but Booth’s driven freekick was held by Brennan. Five minutes later, Aird created space for himself by cutting in from the left but his 20-yard strike flew over the bar. There was a scare for United keeper Siegrist on 23 minutes when he tried to clear upfield but instead hit City trialist Boris Melingui and the ball went out for a goalkick. 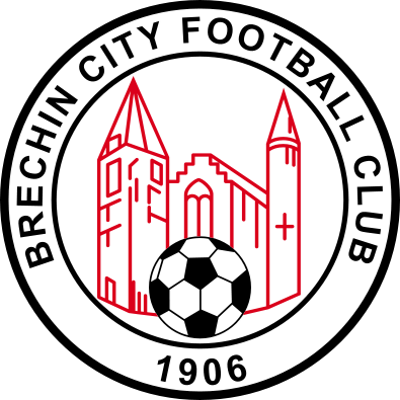 Brechin were battling away and, on 26 minutes, they came close when Sean Burns fired in an angled shot from 30 yards that wasn’t too far away. The Angus men came even closer on 36 minutes when Dougie Hill headed a Callum Tapping corner just an inch or two over. The Tangerines were on the back foot now and City had a good spell of pressure. Play finally went to the other end and, with two minutes before the break Curran blasted a left-foot strike wide of the post. Aird then cut back to Clark but his shot wasn’t strong enough as the visitors regained the momentum. There were three changes for the Tannadice men at the start of the second half, with Matej Rakovan – the ninth new recruit – replacing Siegrist in goal, Paul McMullan coming on for Matty Smith and Jamie Robson on for Booth. McMullan was involved quickly when he played the ball back to Stanton, whose curling shot just cleared the far post. The same player shot into the side-netting on 53 minutes. 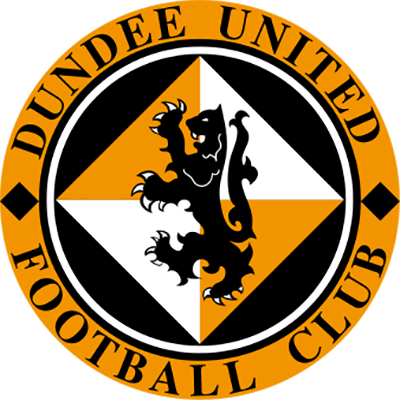 Declan Glass replaced Clark for United, Logan Chalmers came on for Aird and Gavin Ritchie replaced Wardrop as manager Csaba Laszlo continued to assess his options. With 73 minutes gone, Brechin trialist Melingui shot high and wide from a good position. It was 2-0 to the Tangerines on 80 minutes when sub Keatings, who had replaced Curran five minutes earlier, smashed a volley off the face of the Brechin bar and the rebound hit Spark and crept into the empty net. Robson looked like making to three with six minutes left but Brennan pulled off an excellent point-blank save to keep his shot out.